Rover, get me a beer! Just found this show on Animal Planet. If you're a big fans of dogs like I am, then you'll have to tune in to Superfetch (Saturdays 7pm - check on demand as well). The premise is simple, Zak George is the host and super dog trainer. Zak visits two dog owners each episode (30 mins) to assist the owner in teaching their dog a cool new trick. That's it. But the various 'tricks' is what makes the show. With a good dose of patience and plenty of enthusiasm in working with your dog -- a new trick could be mastered over a weekend. 1st Marathon ... did damn well! 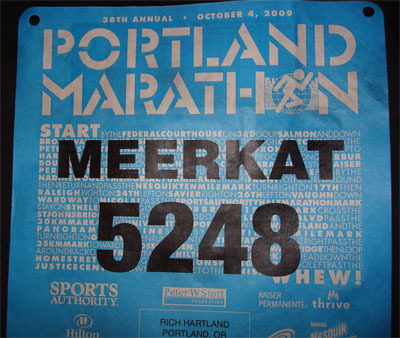 After months of training, hours on the treadmill, and gallons of sweat ... the Portland Marathon quest is over. Finally I can put the Philly Distance Run behind me. Back in 2006 I tackled my first half-marathon, the Philly Distance Run, in which I finished with the time of 2:41:01. Not good. I started the run out well, cruising along until around mile 8 in which my right leg began cramping up. The rest of the venture was terrible, having to stretch, walk, run, repeat, until the finish line was reached. Contact. ©2019 by rich hartland. blog software / best hosting.